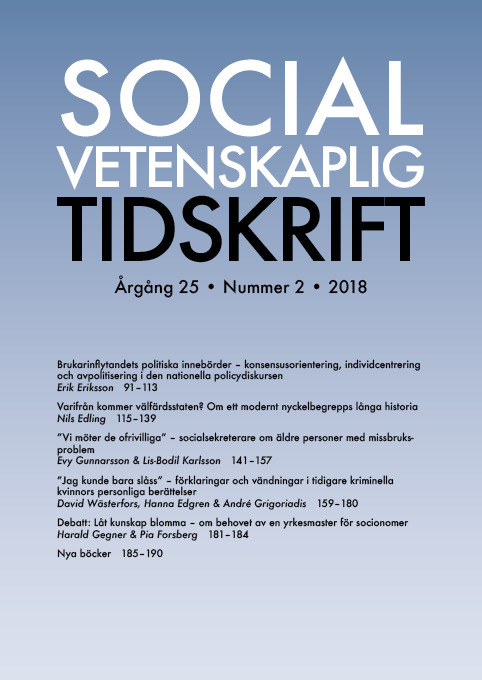 During the last 25 years ”user involvement” has emerged as a prominent concept within the welfare sector, and the aim of the article is to review the Swedish national policy on ”user involvement”. Through a policy discourse analysis inspired by Carol Bacchi, the constitutive effects of the policy are revealed. Three distinctive features of the policy discourse are (1) its open and imprecise formulation, (2) its dominating consensus perspective, and (3) the tendency to focus the argumentation on the service users as individuals, rather than the service users as a collective. The policy has several discursive consequences, such as constructing the service users as subjects responsible for their own well-being; that potential value conflicts are avoided; and that the service users’ ambitions to influence are directed towards welfare organizations rather than political decision-making.